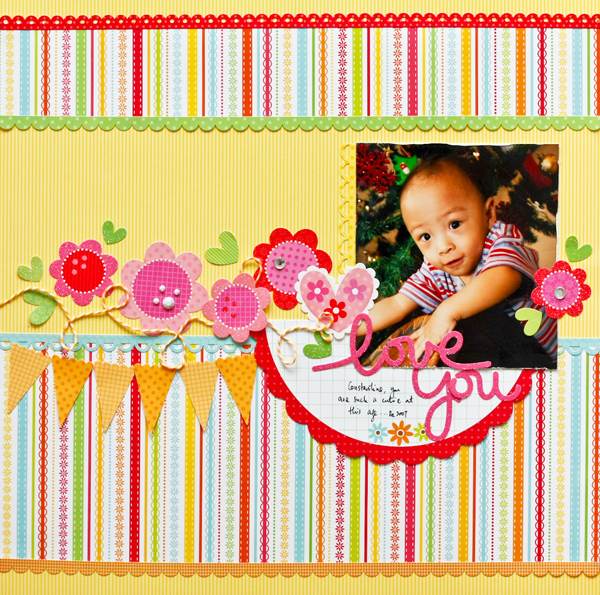 Valentine's Day is around the corner and I was inspired to create a layout for my lil nephew, Constantine. He is such a cute little thing. For this layout, I have mixed a little of everything from 2 different collection just to give you an idea how to play around with the Dooddlebug collection. I love how it turned out to be - fun & cheery. The flower embellies are perfect for boys too! We love our design team members and we hope you do too! We'd like to have you jump over to Jessy's blog and leave a comment for her OR follower her blog and come back and comment that you did this. We'll pick a winner by tomorrow at 11:59pm and announce it before the end of this week. You would be the lucky winner of a fun box of Doodlebug goodies!! I love Jessy's work, am already a follower of hers! thanks for the chance to win! I left a comment, beautiful layouts, loved them all. Great inspiration. Love Doodlebug Design. I already follow Jessy's blog - she is so inspiring. Love her work! I left her a comment for a chance to win some awesome Doodlebug goodies! Thanks for such a generous giveaway! This is a really cute page Jessy! I love the fun colors and how well it goes with the photo! Such a sweet layout! I'm now a follower. Very pretty layout. I am now a follower. Thanks for the chance to win. love the fun spring colours on this page!! you rock jessY!!! left a comment for Jessy! Love the layout, very bright and cheerful. I now follow Jessy's blog! What a fun, colorful layout! I now follow Jessy's blog. 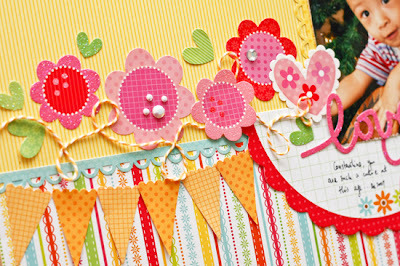 Love the layering of hearts and flowers on this layout! left you a comment Jessy on yr blog, gorgeous layout! I left a comment and became a follower on Jessy's blog :) Thanks so much for the chance to win! This is SUCH a fun and colorful layout! What a fun layout! I love the colors. I love this! I need to use more than one collection and use up some of my stash! super cute blog Jessy has, I think I will be stopping by there more often. Such a cute layout, I went over and left a comment on her blog. This layout is so adorable ... I visited Jessy's blog and left a comment. This is such a bright happy page. I left a comment on Jessy's blog! I signed up to receive Jessie's blog through RSS feed. I left a comment and became a follower. Thanks for the chance to win. I love Jessy's layout. I'm a new follower of Jessy's blog and left her some love. Thanks for the chance to win. I am a new follower and left her some love! THank you for a chance to win! I'm a new follower at Jessy's blog! Thanks for the chance to win! I stopped by Jessy's blog and left her some love. I left a comment and I'm following her. Her work is beautiful!! I stopped at Jessey's blog because her work is so cute! Now I'm a follower!! I really like her creativity! And yep, I'm a follower :) Love colors, as always! Joined Jessy's blog, she is so creative! Joined the blog. Left a comment. Thanks! I love the page Jessy. Left a comment on your blog too! 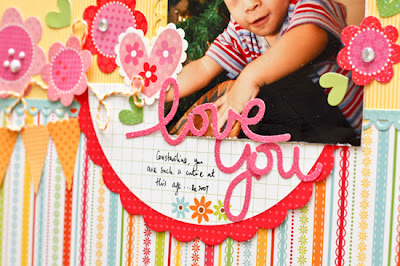 I love what you did and the bright colors and patterns you used! Who says that boy stuff has to be dull and boring. :D Thanks for the great giveaway!! Great layout - I love the colors! Thanks for the giveaway chance! I love her layout! Went to her blog! I left a comment on Jessy's blog...great layout! I visited Jessy and new follower. Great, fun and cheery layout! Hop to Jessy blog already!!!! Thanks!!!!! Adorable layout! I am now following Jessy's cute blog! Absolutely love love love doodlebug designs! Just became a follower and would be in heaven with a bunch of goodies! Thanks for chance to win! gorgeous layout and i'm a new follower of hers. You can't go wrong with Doodlebug. I have all boys and love the fact that you used flowers - something I have always wanted to add to my layouts. Thanks for the inspiration. Done! Just became a follower. I love this paper and the combination...that baby sure is cute too..I visited Jessys blog. Left her a message...but for some reason it still shows me she has no comments. Even after I posted one. Hope its just my phone playing tricks on me. Really love that she scrapped a boy photo with this line, and it looks fabulous! I joined her blog as a follower and left a comment! Adorable page. He is so cute! I LOVE Doodlebug. I went to Jessy's blog, left a comment, and became a follower. Jessy does beautiful work! Love this page & her blog! Jessy's page is super cute! I have loved Doodlebug for years and used their stuff on many layouts. It sure would be fun to win some new stuff! Jessy's layout is adorable! I'm now a follower of her blog. Thanks for the chance to win some goodies! Great Layout. Always looking for Doodlebug ideas and products. Thanks for chance to win some. What a great layout! So cute and love the colours and patterns so much! This layout is just adorable!! I left her a comment and quite happily became a follower.... she is just AMAZING!!! Cute lo! Commented and became a follower of her blog. Following Jess's blog - adorable layout and thanks for opportunity to win. I left Jessa a comment. I love your paper lines and her layout does a great job of showing them off. As I mentioned to Jess's blog - I love this lay-out.